This restaurant is attached to a wonderful food hall, and provides a simple brasserie cooking with a strong Italian influence. The main dining area is located towards the rear of the building and is decorated with an array of packets, jars and bottles. Majestic comfortable chairs welcome you into a pleasant and relaxed atmosphere. Barrel-like lighting creates a lovely ambience for a mouthwatering meal. The menu changes frequently and the food is consistently very good. The wine list is extensive though hugely French. Flaneur aims to provide you with high quality shopping and eating at the same time. This restaurant has received favourable reviews from Hardens London, Which National Food Guide and Time Out London. Black olive foccacia bread is made everyday by the chef and served with dipping olive oil for a satisfying nibble before you start your meal. Service is efficient, knowledgeable and enthusiastic. 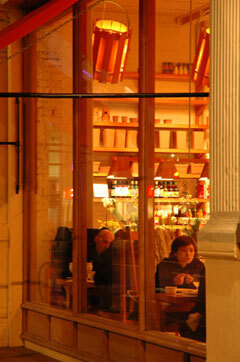 Flaneur also has a food hall, bakery and deli. These sell food and products from small, artisanal producers in France, Italy, Spain, US and UK. Tall shelves are lined with well-sourced gourmet products; wines, baked goods, cheeses, charcuterie and deli dishes. Typical starters include salt cod, rocket, white beans, capers and chilli or parsnip and chestnut soup. Mains include fried sea bass with saffron, mussels and shallots and flavoursome boiled organic gammon well complemented by lentils and parsley sauce. Please note that the menu changes frequently.